Back in April, Facebook announced that right hand column (or sidebar) ads would soon see a major overhaul to make them bigger and more engaging. Effective today (June 24), that change is being rolled out. In the past, you may have seen as many as seven ads in your sidebar. All had a small image (100×72 for link thumbnails, 120×120 for photo shares and 128×128 for video thumbnails), making them easy to ignore. 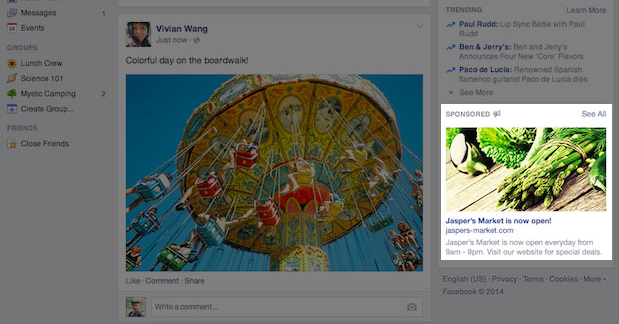 Now, however, sidebar ads will be up to three times bigger, nearly as big as the content in the News Feed. Instead of being cluttered with ads from seven different brands, the sidebar will now focus on only one or two ad units. In Facebook’s tests, this has resulted in far more engagement with these ads. This, of course, is great for advertisers! There has been a lot of confusion over this among advertisers. Many are checking Power Editor or the ad create tool, expecting to see something different in the way they create ads. Nothing changes in the flow of creating ads. This isn’t a matter of rolling out functionality to ad accounts, for example. The rollout applies to users and what they see. If you were previously creating ads using dimensions that apply to desktop and mobile News Feeds but send those ads to all placements, those ads will now be shown with the bigger sizes to those users who have received the rollout. If you were previously creating ads using the old sidebar dimensions, however, those ads will continue to render smaller. For now, at least! Now, however, there is less to worry about. While the images will render larger in desktop and mobile News Feed, they will now have the same aspect ratio across all placements, including the right hand column. Those images will now scale accordingly. On one hand, you could just create one ad that goes across all placements now without issues. To break down performance, of course, you’d use Facebook’s powerful ad reports. Note that this indicates a consistent aspect ratio for image and link shares, which is not currently the case. I’ve checked in with Facebook to get clarification. The price to reach users based on placement has never been equal. I’ve documented in the past how I’ve seen oCPM prices that are 50 times higher on mobile and 20 times higher on desktop News Feed than in the sidebar. Expect that to change significantly. It may remain cheapest to reach users in the sidebar, but these costs will begin to even out. However, those sidebar ads will also become more effective. In the past, I’ve found those right hand column ads to be worthwhile, even though the click through rate was awful. This was due to the low cost to reach users. Now, costs to reach users will increase, but engagement should increase dramatically as well. When all is said and done, you may see very little difference in terms of Cost Per Action. But we’ll need to wait and see. ALWAYS monitor your results. But this underscores the necessity to focus on Cost Per Desired Action, not secondary stats like CTR or CPM. One pretty big pain for advertisers who create News Feed ads is the dreaded 20% rule. No ad image can include more than 20% text (inexactly measured with a grid). Of course, this didn’t apply to the sidebar, which was nice. You could create small images with big text for the sidebar and not have any issues. Going forward, the 20% text rule will apply to all ads, including sidebar ads with the new, bigger images. Actually, that won’t be enforced immediately. June 24: We will begin rolling out the new RHC ad format. Ads that meet the specs for the new RHC ad format will automatically be rendered in the large format. Ads that are not eligible will render in the original smaller format. From June 24 onwards: We will expect a moderate increase in CPMs as ads start rendering in the larger format. CPMs will increase over time as more advertisers adopt the new, larger ad format and stop using the original, smaller format ads. August 1: All new RHC ads that are created on or after August 1 will be subject to the 20% text policy. September 1: The 20% text policy will apply retroactively to existing RHC ads. We will also stop rendering the original, smaller format ads so all of your RHC ads must be updated by this time. So my advice: Start creating your ads using the proper aspect ratio going forward. 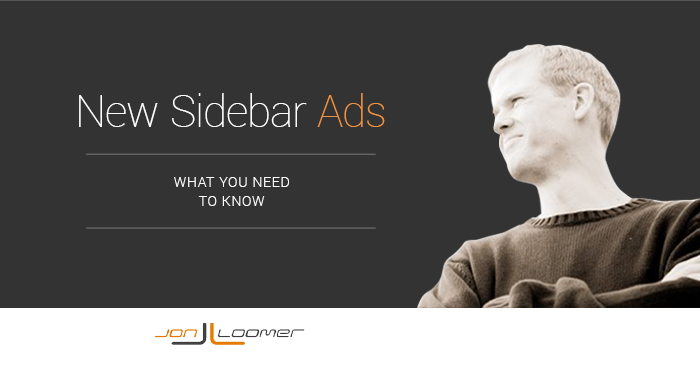 Get into the practice of considering the amount of text in sidebar ads, though that won’t be enforced immediately. Are you seeing these new ads yet as a user? Are you seeing an impact as an advertiser?